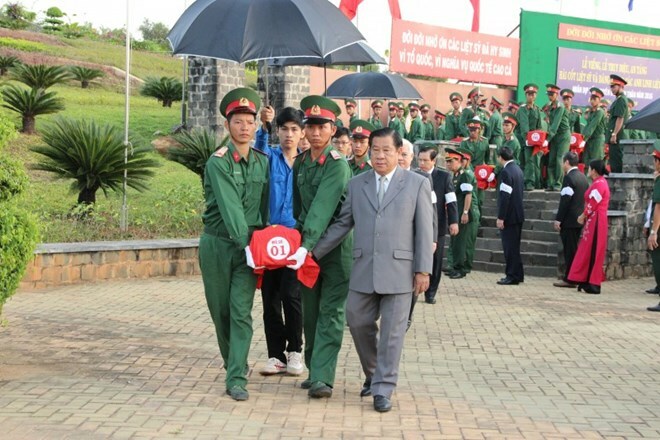 Binh Phuoc (VNA) – A ceremony was held at a martyrs’ cemetery in southern province of Binh Phuoc on February 3 to rebury 70 sets of remains of Vietnamese voluntary soldiers who died during wars in Cambodia’s Kratie and Kampongthom provinces. Of the total, 68 sets of remains were collected in the two Cambodian provinces during the 2015-2016 dry season by the provincial Military Command’s K72 team who is responsible for searching and repatriating the remains of the Vietnamese soldiers in Cambodia. The provincial leaders and participants offered incense and flower to the fallen soldiers, showing their deep gratitude to them. During the 2014-2015 dry season, 141 sets of Vietnamese martyrs’ remains were found while 132 other sets of remains found in Cambodian military zone 3 were gathered and repatriated.